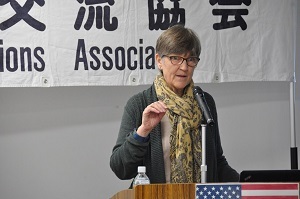 “The Speech by a Foreign Guest” for March 3, 2019 was held inviting Barbara Shenk as a speaker. Two years ago, a couple, Dannie Otto and Barbara Shenk in America were assigned as Volunteer Director of WFC (World Friend ship Center). Holding this event was very lucky timing because we just knew that they were leaving in August this year. The title was “My childhood in Hokkaido”. She was born as a daughter of a missionary in Gettysburg, Pennsylvania which was a sever battle field during the Civil War. Later in 1950, the family moved to Sibecha town in Hokkaido and grew up there. 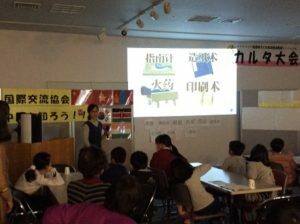 She talked mainly about her life in the primary school age, showing interesting pictures. The town locates in the remote country where only one automobile exists, and the weather was severely cold without enough warming goods. 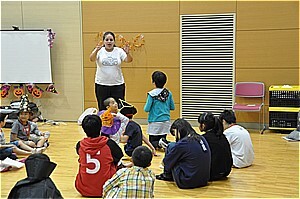 There were some fights with Japanese children before she mastered Japanese language, but soon she melted into the real world and played with them as if she were one of Japanese children. 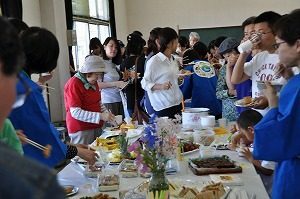 But when there was an event of parent’s association with student’s parents overlooking the class, she realized that she was a foreigner. Then the family moved to Tokyo and she spent her junior & senior high school at an International School. She graduated the university in the USA. She married with Dannie. She engaged in teacher’s job. When she was in charge of special classes, she taught how important the peace was illustrating the disaster of the atomic bomb. She also has an experience with her husband in farming, producing corn. She liked to operate a combine. At the end, her husband Dannie explained the activities of WFC, which was founded by Barbara Reynolds and every two years a new director comes and stays. This organization is engaged in a variety of peace movements for the world. 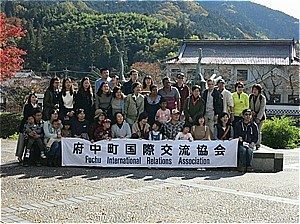 ‘The General Assembly Meeting for 2018 was held at a conference room in Fuchu Community Center on April 21, 2018. 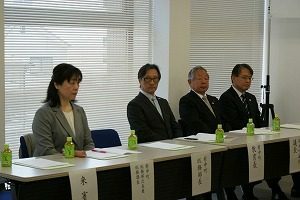 Many honorable guests including Mayor Sato Nobuharu attended the meeting. Three bills, which were the FY 2017 Business and Settlement Reports, FY 2018 Business and Budget Plans and Election of Officers were unanimously approved. This association has been actively engaged in international exchange programs for over 25 years since it was established in 1991. We sincerely appreciate the cooperation of our members. We are also deeply grateful to the mayor and the people concerned in the Town Hall. We intend to work harder to develop our activities through closer coordination with the people concerned. Forty students(1st grade～4th grade) from 5 elementary schools in town gathered and listened to『Things about China』told by Ms.Huang Ying coming from China. They learned some simple Chinese and also got the introduction to the landscapes, food, history and culture of China through screen images. They gazed with great interest at the majestic landscapes and appetizing food of China. At the end of the class, they enjoyed making paper cutting decorations for the Chinese New Year. Upon planning and holding the class, Ms.Bozena from Poland, Ms.Huyen from Vietnam and Ms.Kiyofuji made a great contribution to the success. Thanks to the efforts of all concerned, International Exchange Class was really filled with international character. We had Mr. Preston Backer as a speaker on March ４, 2018. He came from Oregon State in the　USA and now teaching English at Aki-Fuchu senior high school. The title was “My life and experiences that changed me”. He talked about his life so far and incidents and experiences that affected it in detail. I understood that the basis of his attitude toward a life is to pursue to the end whatever he is interested in.Because of his parent’s divorce, he rather led a complicated life like changing the place to live every week. He was given with a sister after his mother got married. Judging from numerous slides that show the pleasant family life, they seem to be strongly connected each other with family love.He had a keen zest for the drama. His drama performance has been gradually developed from his elementary school age and reached to an almost professional level when he was a university student. He showed three comical skits in which he played as an actor. Since his childhood, he has had much concern about Japan. He studied Japanese at his high school and university. But the trigger that made him move to Japan was a serious disease. He suffered from pancreas cancer that is considered most serious and the shortest survival rate among cancers. 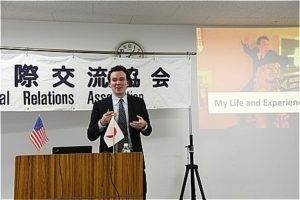 While he was carrying a struggle against the disease with a ball head due to the side effect of anti-cancer drug, he deliberated what he should do in his coming life, and a conclusion was to move to and live in Japan. He met a beautiful girl and married her. Together with her, he came to Japan. He worked ALT at a senior high school in Fukuyama city. He tried to do his best to be adapted to Japan and its people. He talked half in joke that the best way is to visit bars frequently. He is such a person who loves Japan so much, but he is now in a difficult situation to make him leave Japan considering his wife’s life in future. She has a dream to have a bakery, but it is almost impossible legally for foreigners in Japan to do it. To make her dream come true, he decided to go back to the USA and help her open a bakery. Since there were a lot of applications to this event this year, the number of applicants reached its capacity very soon and some of them were on the waiting list. This travel was especially popular among non-Japanese people. 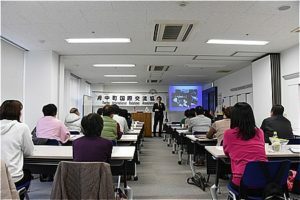 Participants were 45 non-Japanese and 25 Japanese people. There were a variety of nationalities such as Russia, Vietnam, US, India and China. We headed to Tsuwano by two buses. We experienced apple picking at Tokusa Apple farm. We had a lecture on distinguishing sweet apples, simple way of picking and eating in order not to get hands dirty. We also got a lecture on picking apple without hurting branches. It was very fun to pick apples but also satisfied with delicious apples. 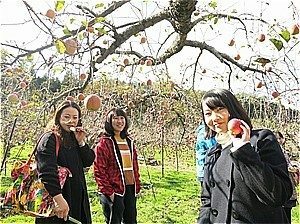 We didn’t know there is the best apple orchard in western Japan where we can go apple picking at the bargain price in such a short distance. Since there are many breed varieties of apples at there, we want to visit again. ook a group photo near the statue of heron dance with a feeling to see the heron dance actually someday.We felt lucky to see an SL of Yamaguchi line near Tsuwano station and the SL was running with spewing out vapor when we passed by the station again by bus. 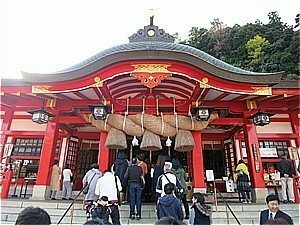 At Taikodani-Inari, we got a lecture from the bus tour guide on purifying and praying ways that are different from other Inari tutelary shrines then we actually prayed. At the steps with a lot of tori gates, we gave up climbing from the bottom but moved to the top by bus because of our physical strength. It was surprising that some good goers went down to the bottom and climbed up to the top again. lecture on picking apple without hurting branches. It was very fun to pick apples but also satisfied with delicious apples. We didn’t know there is the best apple orchard in western Japan where we can go apple picking at the bargain price in such a short distance. Since there are many breed varieties of apples at there, we want to visit again. We grooved a bingo game on the way back from the journey as usual. We were moved from joy to sorrow by readout numbers. We had good weather and finished this research travel without any accidents this year also. 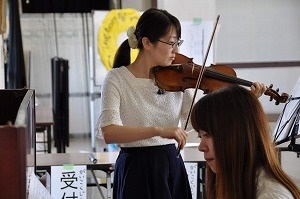 Nine junior high school students in Fuchu town attended the contest. They looked a little bit nervous but delivered their recitation magnificently. Furthermore、3rd grade students, Horimoto Junya and Hattori Miharu（Fuchu junior high）joined three consecutive years and got the perfect attendance award. At the elementally student category, seven elementally students, Kiyohira Airi, Fujisaki Koharu, Manabe Ichiro, Ueno Aoi, Oizumi Sayaka, Sagara Yuina and Hagi Hiyori performed the favorite subject and poem “Rain Won’t” vigorously. 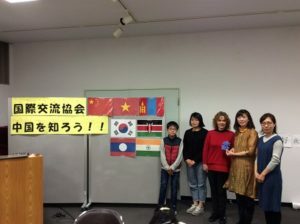 At the high school student category, International course first grader of Aki-Fuchu high school, Capper Minao Helena, delivered her fluentEnglish speechtitled “The Best of Christmas Present in the World. Five contestants from China, Vietnam, Laos and Bosniahelthegobina joined the contest and delivered fluent Japanese speeches. Ms. Cizmic Ada from Bosniahelthegobina delivered her speech titled “We need peace, 私の平和への思い” and got the highest award.